This basket of flowers cake was made specially for Teacher's Day. 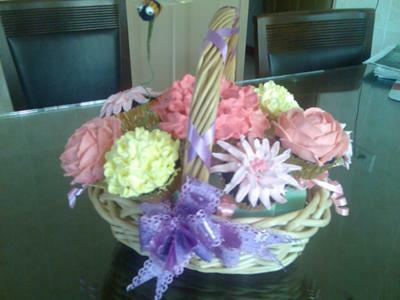 I baked 10 cupcakse and decorated each with different flowers before arranging them on the basket. I pump the cupcakes before decorate it in the basket with some of the flower technique that I learn. Yes, the teachers were very happy and so as the parents of her schoolmate. Everyone were so excited to see this and of course I became popular because of that. Thanks for all your comments. Excellent job! What size are the cupcakes and how did you create the flowers? I am sure the teacher was very happy. I bet the teacher loved it. How cool!!!!!!!! !